Commercially available mastic waterstops are sold in rolls or strips. 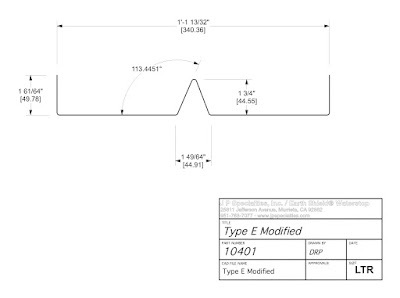 The profile is usually a small rectangle or trapezoidal shape, with 3/4” x 1” being somewhat of a standard. These strips are adhered to existing concrete using an adhesive or primer, or alternately concrete nails at 12” on-center spacing. This adhesion is important, as only three sides of the waterstop will then be exposed to fresh concrete. If the waterstop is displaced during the concrete pour it can easily lose most if not all of its effectiveness. Also, like their similar hydrophilic cousin, mastic waterstops are designed for non-moving construction joints only. No expansion, isolation, or contraction joints. Unlike the hydrophilic waterstops, mastic waterstops are simply a strip of tacky, rubbery compound (usually based on bitumen and butyl rubber) that is designed to “stick” to a primed surface of a cured concrete cold joint on one side, and have fresh concrete cast against the remaining three sides, with the heat from the hydrating concrete causing the product to become even tackier, and therefore sealing the joint by acting as an internal, adhered sealant. 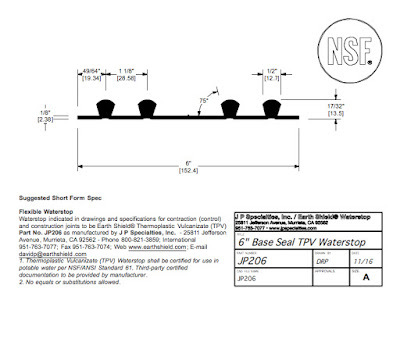 JP206 base seal waterstop is ideal for flat pavement jobs such as runways, large containment slabs, etc. JP206 base seal waterstop is by far the easiest waterstop to install... 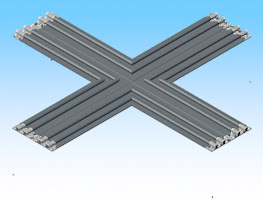 Simply lay the waterstop directly on the compacted subgrade, place and finish concrete, and create control joint using saw cut or other method. 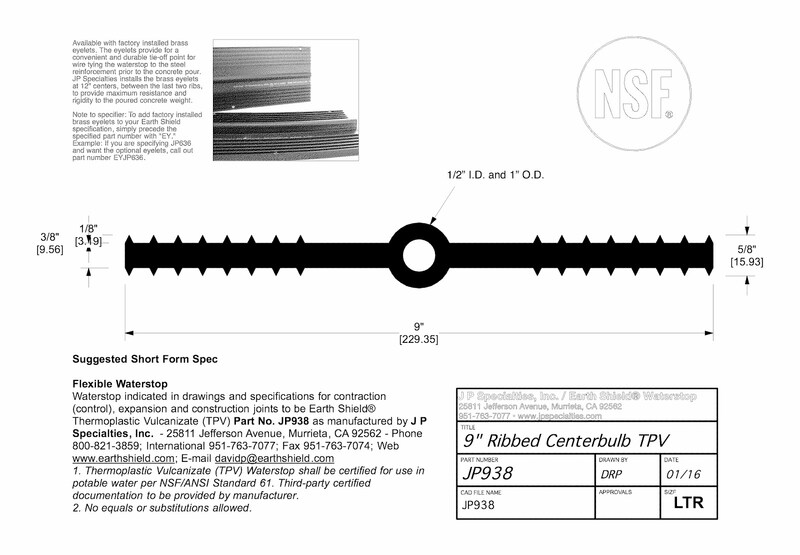 The base seal provides a permanent, life-of-structure seal at the bottom of the joint. Base seal is suitable for construction and contraction (control) joints. Base seal should not be used on jobs that make interior wall transitions as the part is non-symmetrical and therefore cannot function correctly. 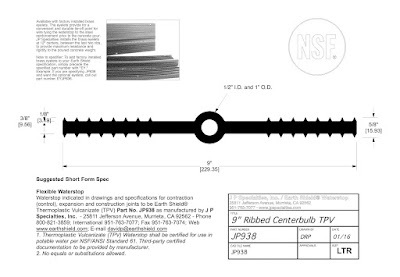 For large hydrostatic head pressures (>50 foot) ribbed centerbulb should be used instead. Like all our thermoplastic vulcanizate waterstops, Earth Shield baseseal waterstop can be heat-welded using a standard waterstop splicing iron. This allows for easy field fabrications, and allows the waterstop to function as a continuous, homogeneous, fluid-tight diaphragm. Waterstop change of directions can be purchased along with straight roll stock, and custom, fit-to-print waterstop modules are produced to order. 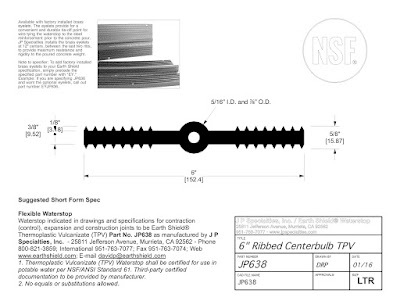 Prefabricated ells, tees, tank pads, column fittings, and many others are in stock and ready to ship. 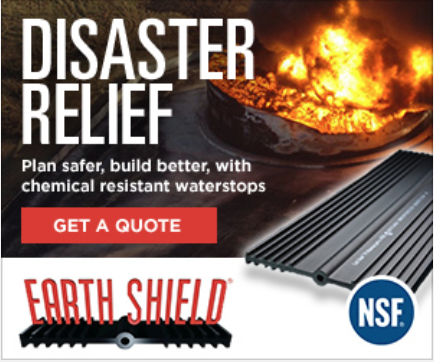 From the leading producer of waterstop products used in the concrete construction industry, J P Specialties, Inc. now add to their range of high-caliber Earth Shield products with the introduction of a material specifically designed to contain oils, fuel and other hydrocarbon products. 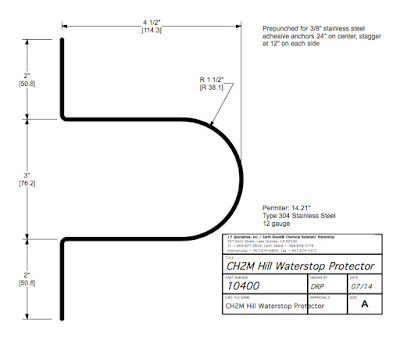 The Earth Shield HDPE (High Density Polyethylene) waterstop will create an impenetrable seal for aggressive non polar fluids without suffering any physical decay or distortion to the integrity of its structure over long periods of time, making it the ideal choice for storing hot petroleum oils, industrial solvents and aromatic compounds such as benzene or gasoline products. This premium thermoplastic copolymer also has the added advantage of being a deliberately engineered, non-toxic plastic which is free of Bisphenol-A and its much publicized detrimental health effects. This also means that it will not bleed potentially hazardous chemicals such as plasticizers, fillers and stabilizers into the surrounding environment when put into contact with petrochemicals. Earth Shield HDPE waterstop is ideal for creating an effective chemical barrier in large tanks and holding areas of industrial scale facilities and with its inert behavior and unrivaled qualities in storing hydrocarbon products safely, securely and effectively. 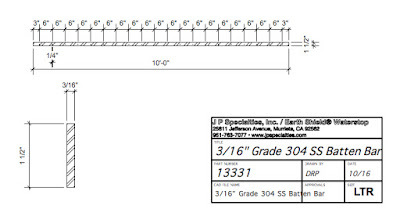 As an established pioneer in the waterstop industry, J P Specialties, Inc. can not only provide high-tech, modern solutions for industrial needs with their range of waterstop products, but they also supply expert technical assistance for both the planning and the design stages of a project, complete with 2D and 3D modeling and both product and project certifications to guarantee the suitability of the product within the overall design. 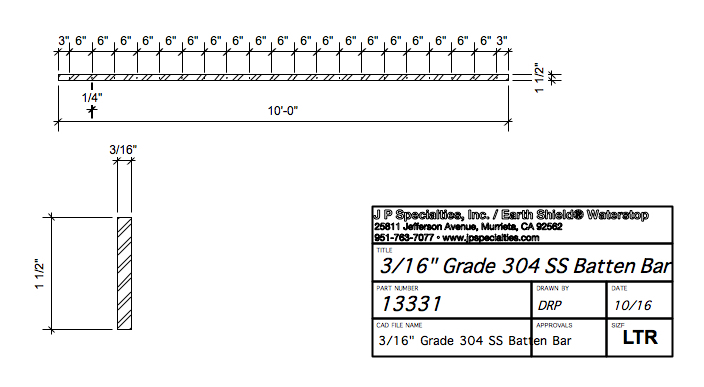 Batten bar is available in a variety of metals, grades, shapes, and sizes. Adeka P-201 is a single component, hydrophilic, modified urethane waterstop that comes in a 10.8 ounce cartridge. 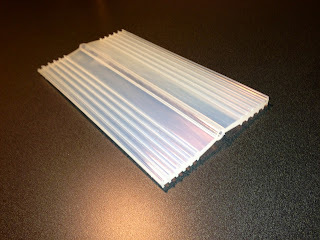 P-201 is used as a waterstop in new construction and in repair applications. It can be placed on damp or uneven surfaces and functions in a wide range of temperatures and ground water conditions. P-201 will expand up to 2 times (100%) by volume in the presence of water. It will expand in the direction of least resistance. When expansion is inhibited, the product will produce expansion pressure against the resisting substance. This expansion pressure will effectively seal off water penetration. The amount of concrete coverage required depends on bead size. 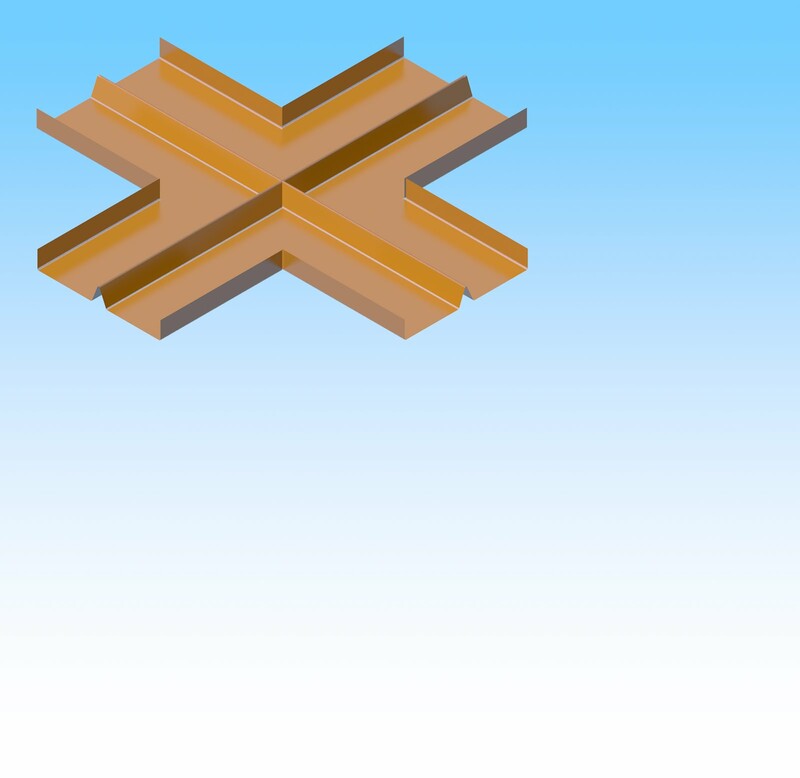 The coverage may range from 2” (1⁄4” bead) to 4” inside a double mat of rebar (1⁄2” bead). Bead size also determines hydrostatic head resistance. 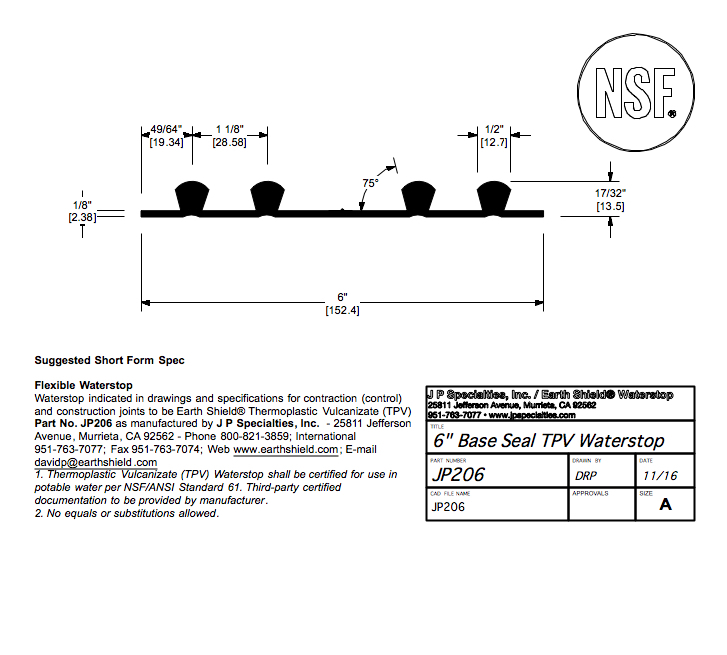 J P Specialties, Inc. is proud to stock and sell P-201 waterstop sealant. Manufactured from 12 gauge, Grade 304 Stainless Steel. 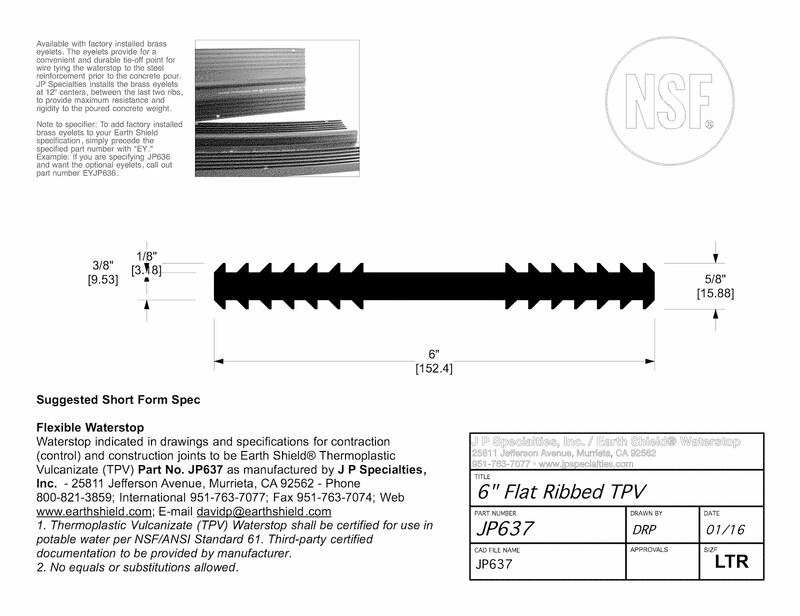 Most commercially available mastic waterstops are sold in rolls or strips. 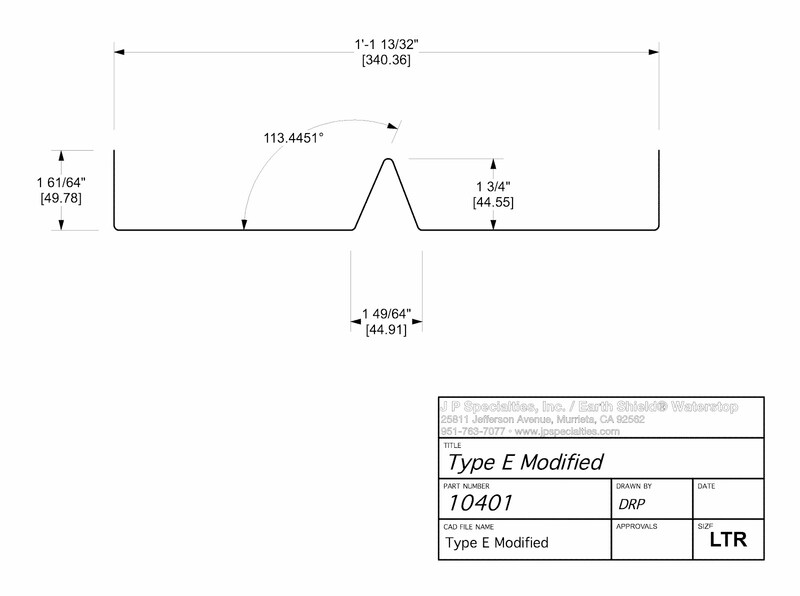 The profile is usually a small rectangle or trapezoidal shape, with 3/4” x 1” being somewhat of a standard. 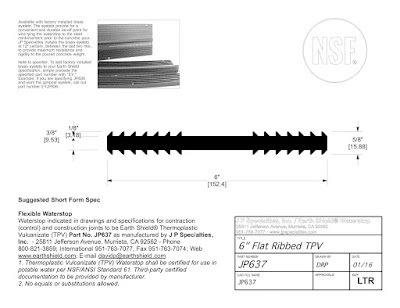 These strips are adhered to existing concrete using an adhesive or primer, or alternately concrete nails at 12” on-center spacing. This adhesion is important, as only three sides of the waterstop will then be exposed to fresh concrete. If the waterstop is displaced during the concrete pour it can easily lose most if not all of its effectiveness. Also, like their similar hydrophilic cousin, mastic waterstops are designed for non-moving construction joints only. No expansion, isolation, or contraction joints. 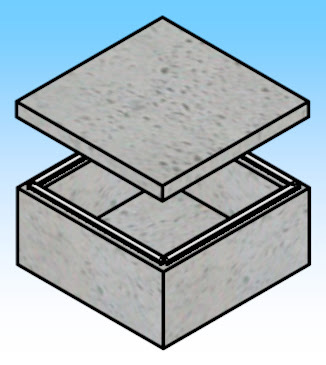 Unlike hydrophilic waterstops, mastic waterstops are simply a strip of tacky, rubbery compound (usually based on bitumen and butyl rubber) that is designed to “stick” to a primed surface of a cured concrete cold joint on one side, and have fresh concrete cast against the remaining three sides, with the heat from the hydrating concrete causing the product to become even tackier, and therefore sealing the joint by acting as an internal, adhered sealant. Obviously, this waterstop function is very limited as the only barrier to migrating fluids is the adhesion to the concrete and compression of the mastic waterstop product within the joint. For this reason, mastic waterstops tend to be more effective in construction situations where large concrete loads are applied on top of the waterstop such as wall on footing or burial vault lid, and far less effective when installed in vertical applications such as a wall joint. 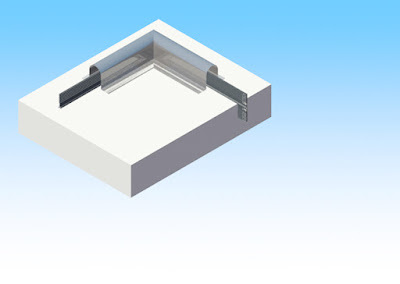 Mastic waterstops are the lowest performing of any commercially available waterstop and are price accordingly, being the lowest cost waterstop as well. Because of the low cost and ease of installation, mastic waterstops are the favored products of commercial constructors and home builders. 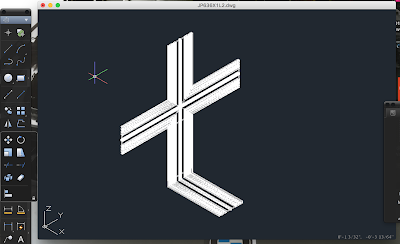 We develop custom CAD for our clients. Always free of charge. The new profiles can be downloaded in our CAD Library located here.